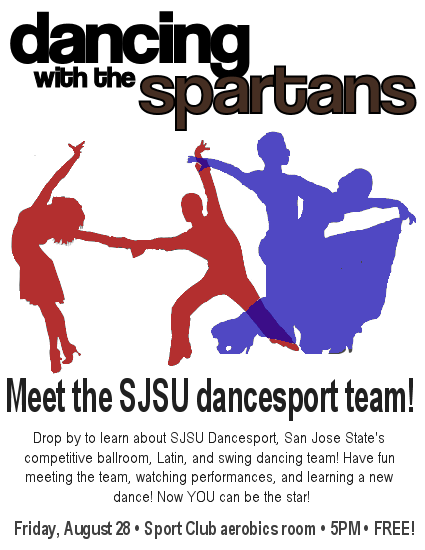 Dancing With the Spartans: Meet the SJSU Dancesport team! Looking for something to do Friday night? Need a new hobby? Want to meet a bunch of very nice people? Come visit SJSU Dancesport for performances, a free dance lesson, and information about the team! No partner necessary! No money necessary! No commitment necessary! All you need is you (though you’re welcome to bring all your friends as well)! Stop by at 5pm this Friday, August 28! The event will be held in the Sport Club (gym) aerobics room — enter the building and turn right; you can’t miss us! ← Welcome to Fall 2015!